Crystals like these can store entangled photons, which show off just how nonintuitive quantum mechanical effects can be. Paul Sutter is an astrophysicist at The Ohio State University and the chief scientist at COSI science center. Sutter is also host of "Ask a Spaceman" and "Space Radio," and he leads AstroTours around the world. Sutter contributed this article to Space.com's Expert Voices: Op-Ed & Insights. Entanglement is one of the most confusing aspects of quantum mechanics — a field of physics that isn't exactly known to be clear-cut, sensible, common-sense and easy-to-understand. Even Albert Einstein himself was flummoxed by the surprising behavior of microscopic particles, and he firmly believed that we were fundamentally misunderstanding the universe with quantum mechanics. It turns out that Einstein was wrong, but it's going to take a while to explain where he went wrong and what's really going on in the quantum realm. One of the most important lessons from quantum mechanics is that we have to completely rewrite our conception of a "particle." Instead of picturing a hard, solid, precise point in space and time, scientists now see a particle as a cloud of fuzzy probabilities, with those probabilities describing where we might find the particle when we look for it. But until we perform a measurement, we can't exactly know everything we'd like to know about the particle. And those fuzzy probabilities apply to more than just the position of a particle. A lot of fuzziness also attaches to a particle's speed, angular momentum, spin and so on. If it's something we're interested in measuring, chances are we don't know what we're going to get in advance. These fuzzy probabilities are known as quantum states. They're neat mathematical equations that summarize all the probabilities of the particle property we want to probe. That's all well and good — if horrendously mind-bending — but the real fun begins when we get two particles to share a quantum state. 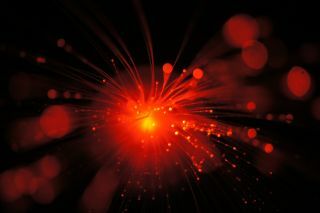 In certain circumstances, we can connect two particles in a quantum way, so that a single mathematical equation describes both sets of probabilities simultaneously. At first, that sounds innocent enough and probably like something only academics would care about, but something funny pops up with this so-called "entangled" state of two particles. Let's look at an extremely simple, but surprisingly realistic, example. We'll prepare our superspecial entangled quantum state so that there are two and only two possible outcomes, each with a perfect 50/50 chance of appearing when we make the measurement. In the first outcome, one particle has a spin pointing up (if you don't know what "spin" means here, don't worry, that's the subject of another article and doesn't really matter for this example). The other particle has spin pointing down. In the second possible outcome, the spins are flipped. So far, so good. We prepare our entangled quantum state, send our particles off on their merry ways and begin to make our measurement. Taking a peek at the first particle, we find a spin pointing up. It could've been down just as easily, but this is like flipping a coin, and we just happened to catch an up-spin particle. What does this tell us about the second particle? Because we carefully arranged our entangled quantum state, we now know with 100 percent certainty that the second particle must be pointing down. Its quantum state was entangled with that of the first particle, and as soon as one revelation is made, both revelations are made. Here's where Einstein interrupts everything. What if the second particle is on the other side of the room? Or across the galaxy? According to quantum theory, as soon as one "choice" is made, the partner particle instantly "knows" what spin to be. It appears that communication can be achieved at faster-than-light speeds, which Einstein thought we had all agreed was impossible. To Einstein, the fault was obviously with quantum mechanics. In a snappy 1935 paper written with Boris Podolsky and Nathan Rosen, he used a similar line of thinking to point out that the newfangled quantum theory wasn't consistent with itself — the ultimate slap in the face to any self-respecting theory of nature. He argued that quantum mechanics fell short of being a full description of the subatomic world and that particles carried with them so-called hidden variables that enabled them to coordinate their states prior to being measured. But sophisticated tests in the intervening decades have conclusively shown, time and again, that no such hidden variables exist. These tests have also shown that this "spooky action at a distance" (as Einstein called this mysterious quantum backchannel communication system that entangled particles seem to employ) does indeed happen in an instant. It does so even when we've sent the entangled particles as far apart as we possibly can. But physicists still go around talking about how important the speed of light is and how nothing can violate that sacred limit. Haven't we noticed this apparent contradiction? The resolution to Einstein's question comes via an excruciatingly careful examination of who knows what and when. Let's say I keep one of the entangled pair of particles and send the other off to you. Eager as always, I look at my particle — performing the all-important measurement — and find an up-spin particle. Smiling with confident knowledge, I send off a beam of light telling you what you'll find. But before the signal arrives, you look at your particle, dutifully measuring the quantum-mandated down-spin particle. But because my message hasn't arrived yet, you don't know if you were the first to look and just randomly got a down-spin or if I opened first and forced your particle into that state. It's only after we compare notes that we discover that the two particles were truly entangled and that the measurement of one depended on the other. Before that communication, we cannot tell if either of us was dealing with an already-set particle. So, while the process of disentanglement happens instantaneously, the revelation of it does not. We have to use good old-fashioned no-faster-than-light communication methods to piece together the correlations that quantum entanglement demands. Thus, Einstein's universal speed limit is preserved, and so is the fundamentally quantum worldview. Learn more by listening to the episode "Can Entangled Particles Communicate Faster Than Light?" on the "Ask a Spaceman" podcast, available on iTunes and on the web at http://www.askaspaceman.com. Thanks to @Infirmus, @pgravinese,Derrick M., John R., Omega Chess, Massimiliano S., Chris S., Michael E., Martin N., Elizabeth C., @bravo102, Joe R., James W., @joshPetry, Kayla M., David A. and @petrodude_ for the questions that led to this piece! Ask your own question on Twitter using #AskASpaceman or by following Paul @PaulMattSutter and facebook.com/PaulMattSutter. Follow us @Spacedotcom, Facebook and Google+. Original article on Space.com.